I came across Singapore-based coffee bar The New Black on Instagram some time ago, intrigued by their concept of serving coffee from around the world, both from 'legendary roasters' and 'new kids on the block'. I've been waiting for their new London location — on Philpot Lane in the heart of The City of London — to open. They have been open for a little while now but their hours — 7:00 to 16:30 on weekdays, 9:00 to 14:00 on Saturdays — had prevented me from checking them out until last weekend. The New Black's London base is right opposite the Walkie Talkie building, which means that even on a Saturday — usually a quiet day for The City — there are quite a few passersby on their way to the Sky Garden at 20 Fenchurch Street. Despite its unassuming façade, the interiors are accented with enough bright neon colours that I blended in rather well in my hot pink down jacket. On the left-hand side is a world map highlighting some of the roasters from around the world whose coffees are currently featured. Many of these names are familiar to and beloved of me: Tim Wendelboe (Oslo), Verve (Santa Cruz, CA), Counter Culture (Durham, NC), and The Coffee Collective (Copenhagen), to list just a few. There are small ceramic cups with samples of each bean available too. A long, futuristic-looking counter runs the length of the café's right-hand side. At the very end is a handy, colourful coffee tasting wheel, as well as The New Black's recommended coffees for brewed and espresso-based drinks, each coffee being listed with its tasting notes. 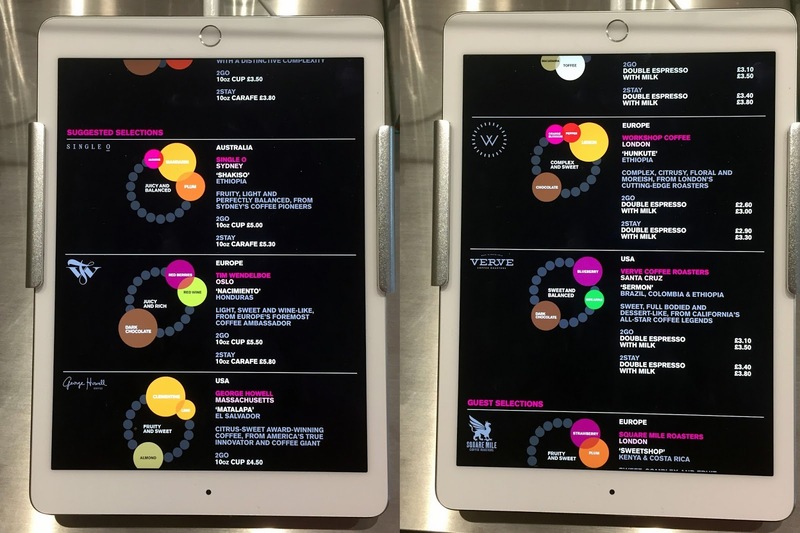 This extensive coffee menu is also displayed on the iPads that are positioned along the counter. Naturally, I wanted to try a piccolo and a filter coffee. For the espresso-based drink, I went with something old (familiar to me, at least): the Sermon blend from Verve (£3.40 as an espresso or piccolo). However, as I was, after all, in The New Black, I felt that I ought to try a new-to-me roaster for my black coffee. I wasn't familiar with Sydney roaster Single O, but their Shakiso variety from Ethiopian (£5) sounded right up my street. Filter coffees are brewed to order through the Alpha Dominche Steampunk. The barista brought over my piccolo first, just as I had to take an urgent work phone call. By the time I'd finished, my coffee was already cooling so, unprompted, the barista made me a new one, which was incredibly sweet. The second one arrived looking more like a piccolo, with a nice latte art heart on top. I also really liked the ceramic cups in which the coffee was served; they come from Singapore. The lighting in the seating area was, alas, not great for photography, but the piccolo was very nice. You could really taste the rich dark chocolatey notes and the latte art remained all the way down. As for the brewed coffee, I was really impressed. £5 is a lot for a filter coffee (£3.40 is not cheap for a piccolo, for that matter), but the subtle flavour notes of the light, fruity and refreshing Shakiso coffee came through really nicely. I'm now keen to try some more of Single O's coffees. The New Black is a good spot for tea lovers too (I didn't investigate the broad offering) and they also serve various cakes and pastries from local bakeries — as I was leaving (just as they were closing), the staff insisted that I take a canelé to try as they would have to throw them out otherwise, and it was a lovely sweet treat. Seating-wise, there are a few small tables next to the coffee bar, topped with cool but not easily photographed shiny metal surfaces; there are more tables in the back, along with a roaster hall of fame. Although the prices are a little steep, I was impressed with both of the coffees I tried and, as I'm always looking for opportunities to sample coffee from new or hard-to-obtain roasters, I'm happy to pay a little more for the privilege. Their Single O filter coffee is, after all, cheaper than a return flight to Melbourne! And with its friendly, knowledgeable staff, The New Black is a great addition to London's coffee scene. The New Black. 10 Philpot Lane, London, EC3M 8AA (Tube: Monument). Website. Instagram.